It happened! Over the course of five days, we came together as a community. 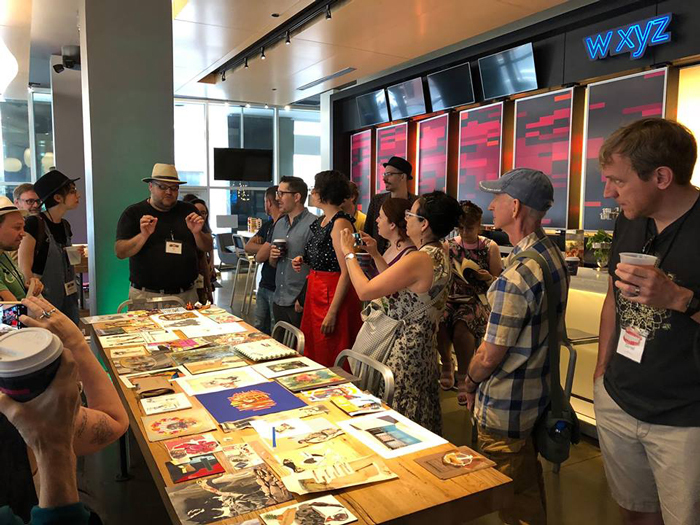 We met, made collage, attended workshops and panels, toured galleries, shared stories, strategized about projects, and held evening events that demonstrated we can take art out into the community. The folks who came to Kolaj Fest fell in love with New Orleans and the city was as gracious and hospitable as ever. I could tell you about Todd Bartel’s fascinating theory of Uncollage, The Jealous Curator’s inspiring talk, the collage making that took place at Artisan Bar, Lucy Julia Hale’s quick and dirty collage making workshop, Aaron Beebe showing up on Saturday morning with hot Cafe du Monde beignets for everybody, the words of wisdom from the galleries we visited, or all the great collage that was seen, made, or swapped. I could share with you conversations about different materials or ideas for a curatorial workgroup or a design firm or an online marketplace. I could go on about how awesome it was to be in a room full of folks who came together out of a deep love for this medium, but frankly words escape me. You just had to be there. If you want to see an iota of what happened, check out #kolajfest on Instagram where folks have been posting pictures and writing reviews of the event. You can also check out the program for the event which is posted online HERE. In promoting Kolaj Fest New Orleans, we said it was going to be an historic coming together of collage artists. It was pretty magical. But the true value of the event has yet to be determined. We sent those who attended home with a mission to manifest what took place at Kolaj Fest in their own communities and in their art practice. Time will tell. For now, we wait to see what fruit will bear from the seeds planted. Now we must decide what happens next. Our goals for Kolaj Fest are to raise the profile and deepen our understanding of collage. We do this through seeing art and hearing presentations about the role collage plays in art, history, and culture. We provide opportunities for artists to introduce their work to others and for academics to share their research about collage. Will there be another Kolaj Fest? We can say unequivocally, yes. The when and where will be announced in the coming weeks and only after we complete our review process and take some time to reflect on how this event can best serve the medium of collage. In the meantime, you can get the world of collage delivered to your door. If you are not already, consider subscribing to Kolaj Magazine. We appreciate your support. Kolaj Fest New Orleans would not be possible without the generosity of Laurie & Doug Kanyer & the crew at Press Street & Antenna: Bob Snead | Natalie McLaurin | Amelia Broussard | Nic Aziz | David Meinhart. Thank you to these folks provided essential programmatic support: Kevin Sampsell and Jay Berrones in the Collage Making Space | Steffanie Arnold and Ryan Skaggs at Aloft New Orleans Downtown Hotel | Monica DaSilva and David Grove and all the staff at Artisan Bar & Cafe | Gene Speas and Robin at Kajun’s Pub | Chuck Perkins at Cafe Istanbul | Marcela Correa at Arts District New Orleans and Jonathan Ferrara Gallery | Dr. Stella Jones at Stella Jones Gallery | Christy Wood & Jordan Blanton at LeMieux Galleries | Stephen Hawkins at Arthur Roger Gallery | Regina Parkinson at Brand New Orleans Gallery | Emily Siekkinen at Octavia Art Gallery | Christina Juran at The New Orleans Art Center | Melissa Kenyon at the Ogden Museum of Southern Art | Yuka Petz at Paper Machine | Cynthia Scott at The Front | Rebecca O’Brien & Rachel Funel at New Orleans & Company. A special thank you to all the artists and presenters who stepped up in remarkable ways and got themselves to New Orleans. When you see them, thank each and every one of them.